NOTICE is hereby given that in accordance with section 106 of the Companies Act. Cap. 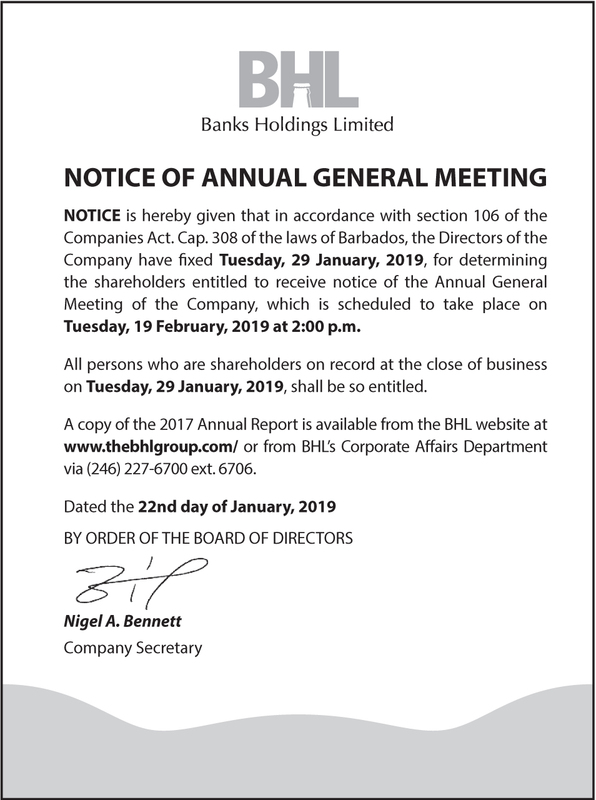 308 of the laws of Barbados, the Directors of the Company have fixed Tuesday, 29 January, 2019, for determining the shareholders entitled to receive notice of the Annual General Meeting of the Company, which is scheduled to take place on Tuesday, 19 February, 2019 at 2:00 p.m.
All persons who are shareholders on record at the close of business on Tuesday, 29 January, 2019, shall be so entitled. airs Department via (246) 227-6700 ext. 6706.